“2.0” contains four brand-new tracks and a new drummer (Renzo van Poecke left his seat behind the drums for Stef Simons). Ruurd Woltring assisted with keyboards. 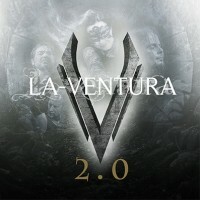 The new release also shows a renewed LA-VENTURA, as the songs are very and more accessible, which can be considered a good or a bad thing, depending on your taste. In any case, it’s not “White Crow 2.0”, I’d say, but it’s got the LA-VENTURA stamp, in any case. “Carry On” is the first track, starting with electronic buzzing and Carla’s layered vocals. The music follows a little later, with the band’s typical Groove Metal. It’s always been like this: Carla’s melodic voice contrasting with the heavy guitar of Saz Kondic. Atmospheric backing gives the song more volume, makes it sound more complete. The spacey-sounding chorus is where all vents are opened. It’s a simple song, with a simple structure, but it sounds so good and so catchy. “As I Lay Dying” is next. No direct start or intro, but the music comes fading it. Vocals are added, but to complement the music, not to sing lyrics. Again you’ve got atmospheric, grooving verses where the singing is layered, which creates a nice effect. The melodic aspect increases in the chorus. There’s also a bridge, somewhat darker (especially in the vocal department) than the rest of the song. This track reminded me, in a way, of (the Finnish melodic Metal band) CRIMSON SUN’s songs. As before, LA-VENTURA keeps it catchy and accessible. “Brave Man” starts with the chorus: midtempo, melodic grooving. No vocals yet, those come in with the firm verses. The heavy, grooving guitar sounds leave no option for melody, so it’s up to Carla to provide this ingredient. The classic LA-VENTURA touch remains intact. Last but not least, the heaviest song of the pack: “The Great Escape”. This heavyweight starts instantly, but the mix left room for the bass to come through (finally). The singing is again well done… and not layered this time. Woohoo! Then again, the “unlayered” moment doesn’t last long. This might be the heaviest track on the EP, but it’s at some point relatively Poppy. Hats off for the vocal melodies, though. Long story short: LA-VENTURA continues to deliver the goods, no doubt about that whatsoever. The combination or contrast of heavy grooves and clean, melodic singing works very well in this band. And yet, I had the (perhaps wrong) impression that the songs felt too short; a feeling I didn’t have with “White Crow”. Or maybe the new stuff is so good that I want(ed) it to sound / last longer. In any case, “2.0” is recommended material for anyone into melodic, grooving Metal.